Have you read Part 1 yet? 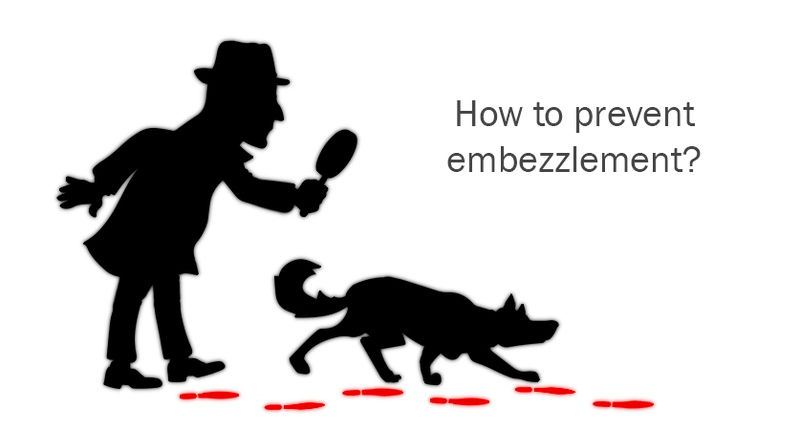 HOW CAN I PREVENT EMBEZZLEMENT? Smart Hire. Embezzlement cannot be 100% prevented, but you can implement strict measures to minimize the risk that it will happen in your office. The strongest safeguard is to hire honest, reputable employees. Always check references and perform background checks before hiring an employee. Personal character references are generally worthless. Request and check references of former employers. Listen carefully for what is not said if the reference is less than glowing. A good source for online background checks is www.netdetective.com or www.castlebranch.com. Software Safeguards. Hire a practice management consultant to maximize security controls on your practice-management and accounting software. A good software system will allow you to set up customized security and provide the reports you need to monitor your staff. Learn which specific reports you need to scrutinize daily, weekly, and monthly. “Getting the Most Out of Quickbooks in Your Practice” lists these reports and how to memorize them. Password controls. Only the dentist should have the administrator rights to any software. That password should not be known by anyone or used by anyone but the dentist. Passwords should not be written on sticky notes, attached to the computer monitor or placed in an area accessible to any others. Be creative when constructing passwords. Create passwords that no one can guess or would know. Since audit trail reports reflect which user makes changes, the user, as well as the dentist should protect passwords. Do not use common phrases (“password” or “dentist” or “1234”), easy-to-remember dates, or duplicate passwords from other programs as your password. Best practices uses six to eight alphanumeric (letters and numbers) characters. Alternate letters with numbers, using both capital and small letters. A symbol may also add extra protection. Using remote-deposit capture for checks not only protects against returned checks, but helps protect against embezzlement. The Check 21 Act allows practices to use third-party machines to scan patient checks and submit these checks for deposit as a batch immediately into your bank, just as you do with credit card terminals. This prevents embezzlers who may ask patients to leave the payee field blank on their checks from cashing the checks for themselves. Contact your insurance companies to have insurance payments deposited directly to your bank. Detailed insurance deposit reports will still be sent to your practice. Print the day sheet detail report immediately, including any adjustments. Print the audit trail report, including any appointment changes. Physically batch out the credit card terminal, printing the summary report of the day’s charges. Do not wait for the credit card company to batch out your charges. These charges must match the credit card charges listed on your day sheet. The physical deposit slip total must match the cash and checks total from the day sheet. Along with the above-listed reports, the dentist should review the physical patient sign-in log to verify all above totals match with all patients treated. Employee Controls. Hiring trustworthy employees is not enough of a safeguard against embezzlement. Utilize your software’s capabilities to verify their honesty as part of your business’s standard operating procedures. In the event that something amiss does arise, you can take immediate corrective action before a possible problem has a chance to escalate out of control. Employee Pay Advances. Life happens. Needs arise. An employee who requests a pay advance is less likely to steal from you. Having a policy and plan to address this situation can alleviate uncomfortable conversations and establish expectations. Use a legal document to state the amount advanced, how it is to be repaid (by payroll deductions, etc. ), and what will happen if this employee should leave your employment before the advance has been repaid (you will deduct the remaining amount due from the employee’s final check). Cross-train Team Members. Again, the classic behavior characteristics of an embezzler include a domineering and controlling personality, working early/late/weekends, never taking sick time or vacation, never allowing anyone else do his/her job, isolating self from other team members, is critical and stirs up dissension, shops often for nice clothes, jewelry, and cars, and lives beyond family income. However, not all controlling personalities are embezzlers. Some overly conscientious employees may simply be obsessive compulsive about their job position, making them extremely efficient! Still, team members need to be cross-trained regardless of job descriptions and duties. This makes good business sense for the smooth operation of the business in the event that the person primarily assigned certain tasks becomes unavailable due to illness, injury, or family emergency. Tasks such as collecting and opening the mail, entering insurance checks into the practice software, making deposits, reconciling the bank statement, etc. should not be delegated solely to one person. Not only does this help safeguard against embezzlement, but it increases office efficiency. You are your best auditor. Install and maintain systems of cash control. Be alert for unusual occurrences that may indicate funds are being misappropriated and discuss the incidences with your accountant immediately. Must Do Rules for Handling Money! Divide the duties of handling cash between two or more people. Write a receipt for every payment. Record every charge and payment daily in your electronic accounting program. Verify all daily report totals each day in your electronic accounting program. Audit this against your appointment schedule. Require a daily deposit of each day’s payments. The deposit must be made immediately after balancing the daily totals or at the latest, the next morning. Use a night deposit box if necessary. Prepare deposit slips in duplicate. The name and amount of each check must be listed along with the total amount of cash and coins. Double check that you have entered the total correctly on the deposit slip, as banks are increasingly reluctant to correct errors of less than $5. The deposit must equal the daily audit or daily summary report from your practice management system. If a discrepancy is found, an explanation of the amount and cause of the error must be discussed with a supervisor or practice manager. Staff must save incorrect daily summary sheets to provide an audit trail for the corrections made. Have an outside accounting firm do the bank reconciliation if you do not wish to do it yourself. Deposits should be balanced to the practices’ daily and monthly practice management report. Maintain a change fund to make change for patients. Keep a separate petty cash fund to pay for postage due and other incidental expenses. Do not cash checks for employees out of cash from a daily deposit! Allowing such a practice invites abuse. Store all day sheets or computer reports as well as deposit slips in chronological order with the most recent report on top. The owners of the practice as well as the office manager or administrator must utilize all controls such as spot-checking individual transactions, deposit slips, ledger cards or computer accounts. All checks written for accounts payable must be presented to a dentist/owner for signature with the invoice attached to the check. This includes the requirement to attach a computer account printout in the case of refund checks. Utilize QuickBooks or other financial software programs to track office finances and create an audit trail. Only a dentist/owner of the firm should sign checks. Make sure to review the invoices! Routing slips, pegboard Superbills or receipts must be pre-numbered and each slip accounted for at the end of each day. Only a dentist/owner must be permitted to authorize a write-off or reduction of a patient’s account balance. Make sure all employees with access to cash are bonded and informed of the coverage. Insurance companies usually prosecute dishonest employees. Require employees to take at least one vacation week per year (five or more consecutive days). Do not allow employees to take accounting and financial records (including insurance claim forms) out-of-the-office to work on from home. Violation of any of the above rules is grounds for termination of employment. Mail bank statements directly to the dentist’s home or accounting firm – not to the practice! NEVER LET ONE EMPLOYEE BE IN CONTROL OF ALL FINANCIAL TRANSACTIONS. Embezzle-proofing a dental practice begins with the dentist and should not be delegated to the office staff to accomplish. The one you may be depending upon may be the one performing the illegal task. If embezzlement is currently suspected, immediately retain outside expertise to discover any inconsistencies within the financial affairs of the practice. The professionals retained should have expertise in healthcare and understand the particular financial and operational issues existing in today’s dental practices. If embezzlement is not currently suspected, but concern exists regarding office policies, procedures and controls, retain a professional with expertise in healthcare management, finances and operations, who can work with you and your staff to establish the necessary controls, safeguards and division of duties that can assist in protecting the practice in the future. Bond all employees who have access to financial dealings in the practice, as this will form protection if future embezzlement occurs. I SUSPECT EMBEZZLEMENT IN MY PRACTICE…NOW, WHAT DO I DO? First and foremost, get legal advice from an attorney and accounting advice from your CPA. The attorney can help you decide whether or not to prosecute. An outside auditor, forensic accountant, practice software specialist, as well as a human resources (HR) specialist may also be needed to assist with the investigation. Next, make sure you have documented proof and legal advice before confronting anyone. Again, an attorney and HR specialist can coach and advise you through this process to help avoid or eliminate potential liable mistakes during the termination and documentation process. Always consult your attorney or HR specialist before any confrontation to ensure you are adequately and fairly documenting evidence prior to termination or confrontation. Third, once you have consulted with an attorney and HR specialist, and have acquired the proper documented proof, terminate the embezzler’s employment. Best practices are to file a police report and prosecute. Regardless of the circumstances, it is never right for someone to take money from your practice. Choosing not to prosecute allows the cycle to continue and puts your fellow colleagues – the next employer – at high risk of embezzlement. Embezzlement can happen in the blink of an eye. The act – in whatever form – often takes just a few seconds to perpetrate. 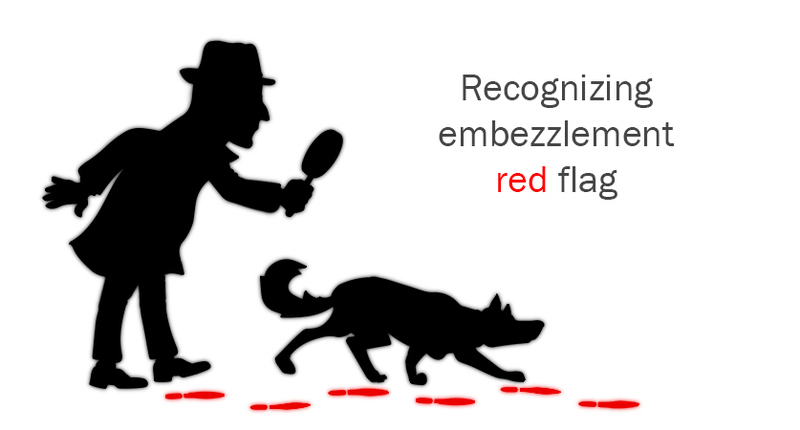 Even with the best of established controls, there is no “iron-clad” methodology to ensure embezzlement will never occur, but with proper controls and oversight, it can be minimized. Every dentist within a practice needs to be aware that it can happen, be proactive in steps to avoid or minimize embezzlement and utilize the necessary professionals to ensure that the “business” of the dental practice is functioning properly to protect the dentist’s financial future. It takes much less time and money to perform background checks, call for references, and implement procedures than it does to recover from embezzlement. If someone really wants to steal from you, they will. Do not make it easy for them! Practice consultants and accountants are your second set of eyes and ears. They see things you may not see. Listen to their concerns and implement their controls. Do not let ignorance set you up for theft. Learn your software. Implement tight controls. Cross-train your employees. No system can totally protect you from embezzlement. Implementing safe business protocols and cash controls can thwart or discourage the novice embezzler and even protect you from more experienced office crooks. Experts helping Dentists: Spend more time with patients; Build a vibrant practice; Optimize financial well being. We enhance lives one client at a time.